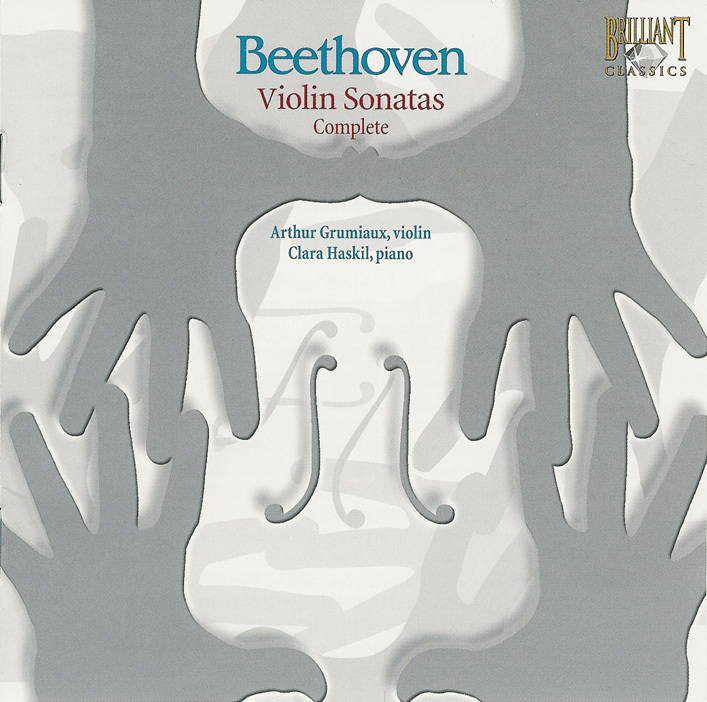 Among the important groups of works that I've never heard enough of, I want to get a complete set of the Beethoven violin sonatas and would like your thoughts. All the greatest violinists have done complete sets, so I can choose from among Heifetz, Grumiaux, Szeryng, Perlman, Menuhin, Kremer, Kreisler-- it's an embarrassment of riches. Several sources I've looked at recommend Kremer, I suspect partly because the recording quality would be up to current standards. I've been a fan of Szeryng, and of course all those other stars would all be great. So, as usual, it's only partly what's the "best" in some objective sense and largely what approach I personally like. But I'm still uncertain, so I'd like to hear from all you opinionated people (and what classical music fan isn't opinionated!?). If you're a fan of Szeryng, get Szeryng, I say. I like Kremer, generally, but I probably would not choose to get his recording of something if was going to be the only recording in my collection. He's a bit quirky. 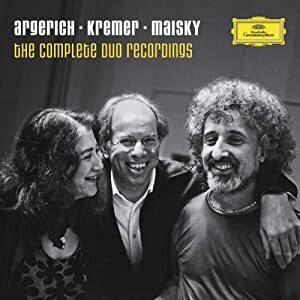 But for the price of the Kremer set, you can get the Argerich/Maisky/Kremer box, which includes those recordings and a lot more. It hasn't been released in the US yet, but when it is (next Tuesday) the discounters will drive the price down. ChrisBrewster wrote: Among the important groups of works that I've never heard enough of, I want to get a complete set of the Beethoven violin sonatas and would like your thoughts. All the greatest violinists have done complete sets, so I can choose from among Heifetz, Grumiaux, Szeryng, Perlman, Menuhin, Kremer, Kreisler-- it's an embarrassment of riches. Of those you mention, I'd specially recommend the recordings by Arthur Grumiaux and Clara Haskil, which are available from amazon.com at a very low price. These sonatas are for piano and violin as much as they are for violin and piano, and Clara Haskil is a much more positive pianist than, for example, Heifetz's Emanuel Bay or Kreisler's Franz Rupp, while being a better partner in these duos than Martha Argerich. Excellent monaural sound. The David Oistrakh/Lev Oborin set isn't bad, either. I have many, many complete sets, and then individual recordings. My all-time favourite for many years—and the one I turn to the most—is the Haskil/Grumiaux set formerly on Philips and now on Decca. It's just heartfelt playing by two artists who worked together for many years. Grumiaux's sound is seemingly specially made for the Beethoven sonatas while Haskil knows eactly what to do with the piano part. Grumiaux was also a fine pianist and Haskil started out her musical life studying the violin but had to give it up due to illness. It's no wonder then that this set is a treasure since both artists were familiar with each other's instrument so well. I second the notion of the Szeryng/Rubinstein collaboration though they didn't record all 10 violin sonatas. This is one group of sonatas that has been exceeindgly well documented on records. I would agree with my fellow CMGers that the Grumiaux/Haskil is an excellent set. The Oistrakh/Oborin cycle on Philips is also quite good - I'm surprised you left him out of your "great violinists" list. I worship Szeryng, but I must disagree with other CMGers, that set is not ideal. It's not his tone, mind you - that is still flawless - I just found that in some of the faster sonatas, such as the Kreutzer or sonata #7 in C minor, they come off as snoozefests. I also have the aforementioned Szeryng/Rubinstein disc but I can't stand Rubinstein as an accompanist so for me that's not in the conversation. You might also take a look at Schneiderhan/Seemann on DGG Trio. A great bargain, and very fiery playing from Schneiderhan. He was the DGG house musician for violin repertoire in the 50s and 60s, and he really digs into the big sonatas with impressive gusto. Seemann was a very able collaborator and complements Schneiderhan perfectly. As previously mentioned Schneiderhan/Kempff is excellent as well, in fact better than the later set; but that set is in mono, which is a dealbreaker for some collectors. Lucky for you, there are a bunch of great options in this repertoire, and you could choose one of at least ten or so different sets and not go wrong with any of them. Grumiaux and Haskil ....needless to say. I'm an admirer of a complete underrated set very few know: Igor and Natalia Oistrakh. Oistrakh the younger didn't seem to enjoy the career status of his famous father. Perhaps he did/does in Russia I, too, have a number of recordings by Igor. Is/was Natalia Oistrakh Igor's mother or his wife? Was this issued only on LP via Melodiya or did the Igor/Natalia set see the light of day on CD? It's great to see you on CMG oisfetz! Wish you would come around more often! oisfetz wrote: I'm an admirer of a complete underrated set very few know: Igor and Natalia Oistrakh. A few recordings of Igor Oistrakh appeared on the Collins Classics label in the UK but I don't think the label survived to CD (I may well be wrong). These included the Beethoven sonatas (not sure if they were all released). There was also a good Paganini disk with a fine performance of the lovely Cantabile amongst the fireworks. 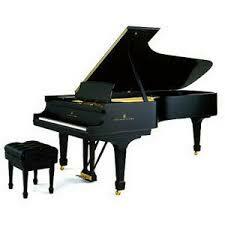 His accompanist, Natalia Zertsalova was (is?) his wife. I heard him live in the early 80s, playing a recital in a small hall. The first half contained very high powered (forceful) performances of the Kreutzer sonata and Mozart K454, I found both too hard driven and nearly left, disappointed, at the interval. The second half was full of Paganini and dazzling showpieces, a superb display of violin playing. He also included a beautiful performance of Widmung. Back to the subject, despite my undiminished love of David Oistrakh's playing, like many others, I prefer the Grumiaux/Haskil version of the Beethoven sonatas. I'm also very fond of Kreisler, too personal to be a sole recording but a set I wouldn't want to be without. I believe Igor's set wasn't published on CD. I got it on copies from an Electrola/Melodiya LP box. About him, his recordings of Rakov's first, Wieniawski's 2, Khatchaturian, Bruch's 1 and Mendelssohn are IMO fantastic. Thanks for the interesting responses. I was surprised that there something close to a consensus (for Grumiaux), since questions like mine usually get such diverse responses, one is left just as uncertain. ContrapunctusIX wrote: I would agree with my fellow CMGers that the Grumiaux/Haskil is an excellent set. The Oistrakh/Oborin cycle on Philips is also quite good - I'm surprised you left him out of your "great violinists" list. My list was hastily put down, and I think some of that I mentioned didn't do complete sets. I had just been looking at what was available and, not surprisingly, all the luminaries were there.